This has been an exciting week of planning. You don't tend to think of planning as being an exciting process, but this was. I traveled to Leiden in the Netherlands to visit the world famous Pedro Russo. If you were involved in any part of the International Year of astronomy in 2009, you will have had emails beginning "Dear Friends" giving you weekly updates about exciting astronomical events happening in local and remote parts of the world. 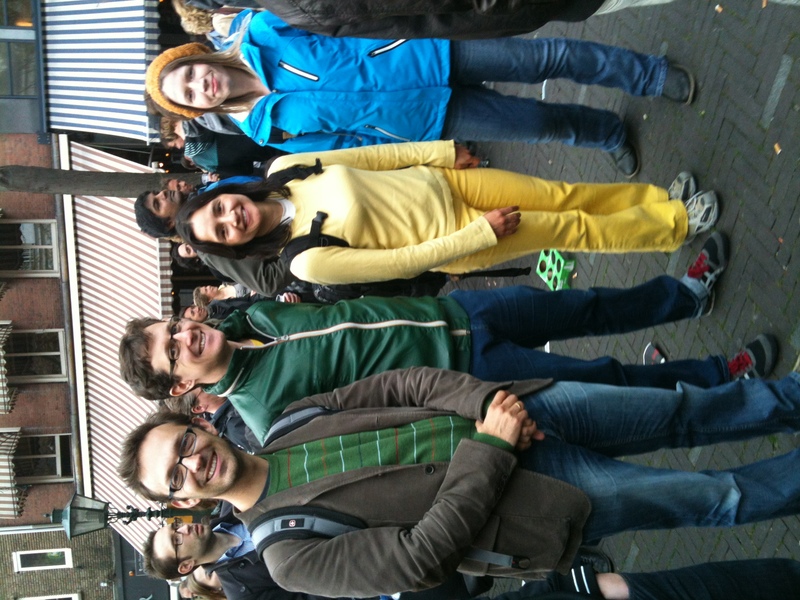 Pedro now is the international coordinator for the Universe Awareness programme, based in University of Leiden. Recently he and I have taken the reins of an IAU task force for children and schools, under the guidance of the IAU's office for astronomy development. The 2 of us and our task force members are tasked with helping to form a strategy which will inspire children and schools in developing countries to engage in science investigations at any level. It was rather a jolly week all told. I stayed in a very pretty part of Leiden in a huge town house which the owner is exploring turning into a guest house, using the Netherlands "4 bed rule" - where any house can be a guest house as long as you don't rent more than 4 rooms out. Pedro used his powers to persuasion to get me a bike to use for the week too, which was incredibly handy for getting around. It took some mastering because it had neither brake levers nor gears. You had to back-pedal to brake. I only fell of once or twice. Per journey. I will certainly be taking my Brompton on my next visit. We spent a very fruitful week discussing plans for our IAU task force (I really think we should have an outfit like superheroes or at the very least a sports strip), created a collaboration between our 2 projects (Las Cumbres Observatory and Universe Awareness), and had a jolly time throwing science outreach ideas around. 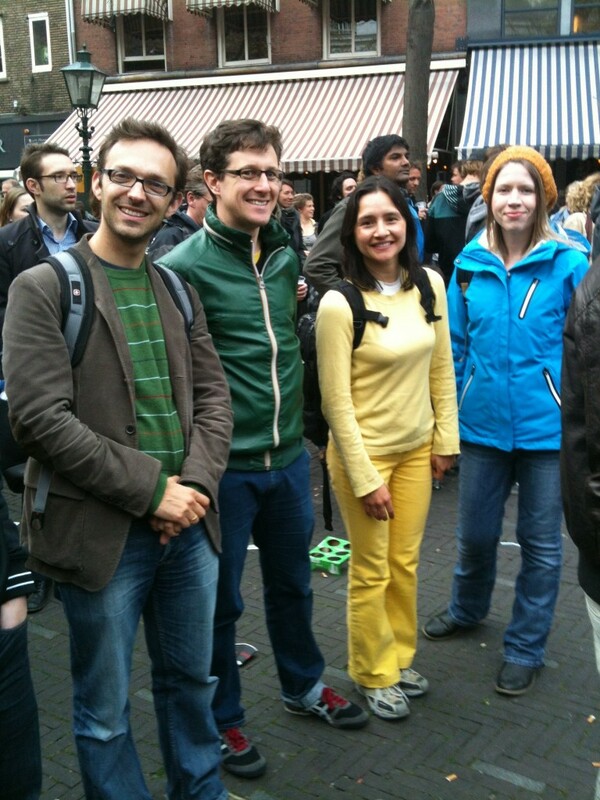 On my final night we took a trip to the Hague to sample the delights of a local festival, Pop Hot Spot, where we were introduced to the music of a band of 16 years olds called Jungle by Night. Their musical genre was something called Afro beats (which I have never heard of) but reminded of prog-rock music, particularly Yes. Maybe in 40 years they will still be touring and making a comfortable living of the songs they wrote in the youth. I rather enjoyed what they had to offer, particularly where they said that the next song was inspired by Murder, She Wrote. I'm not entirely sure of the root of this inspiration, but you never can tell with these arty types. Maybe there was an off stage murder, or maybe they composed it in Cabot Cove. 17 May was a public holiday in the Netherlands in celebration of the newly regenerated Jesus' ascension into Heaven, so that mankind can get on with religious wars and prejudice for the foreseeable, without the almighty giving them disapproving looks. 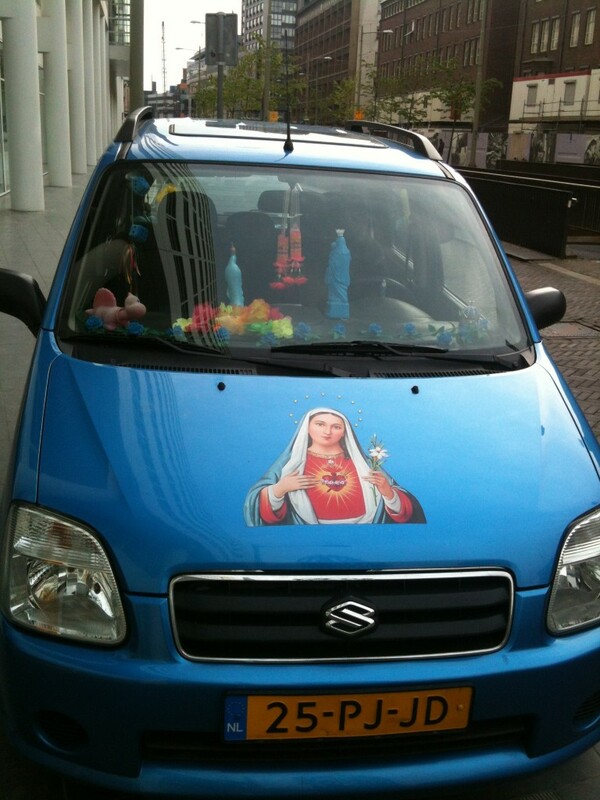 The owner of this car is clearly a big fan of Jesus' mum. They missed a trick. 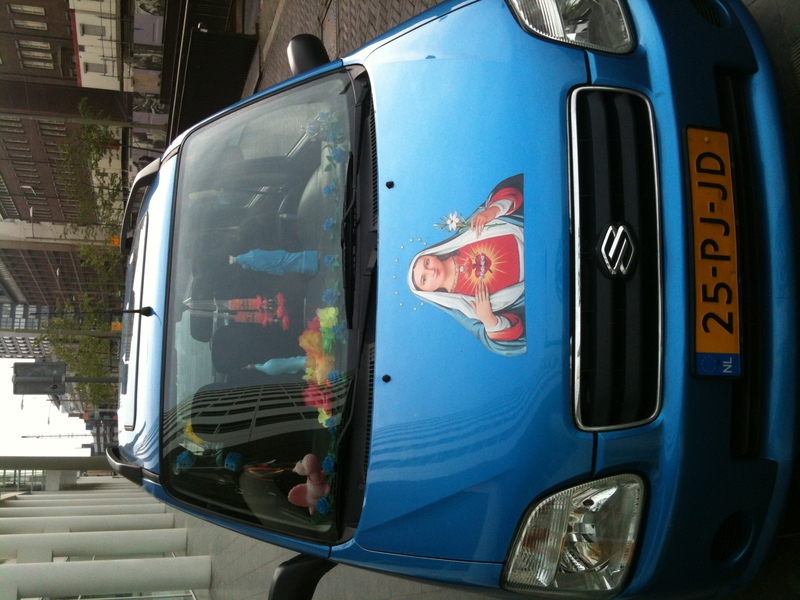 If only they'd had the Blessed Virgin Mary (BVM) stenciled onto a BMW. Notice the dinosaur on the dashboard; they're clearly not all bad. The Cardiff-Amsterdam city hopper service by KLM makes it so convenient to pop over the Leiden I hope this is the beginning of more collaborative trips, in both directions. A word to the wise, there are the most delicious waffles to be had in the vending machine of the Leiden University Physics department. Only 80c too.